Good afternoon, chums. Are we familiar with The Big Fat Quiz Of The Year? It is, as you’d guess, an annual quiz show, on which funny British people (and the occasional funny token American) answer quiz questions and crack wise. This year’s edition (with token American and constant delight Michelle Wolf) featured frequent guest Noel Fielding, who also serves as one of the hosts of The Great British Bake Off (or The Great British Baking Show, as it’s known stateside). He took the opportunity to drop some hot GBBO goss, and it is this: those beautiful meringues and tarts and biscuits and Baked Alaskas sometimes get fed to Prue Leith’s pigs. If you’ve never seen a Big Fat Quiz and like British TV, I highly recommend it, and you can watch this year’s above. If you just want the relevant bit, that’s cool too, as the link is cued to the beginning of the segment. 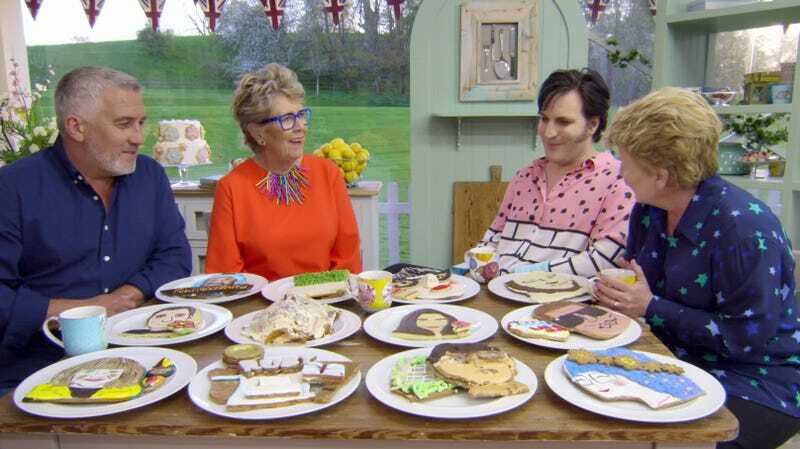 Said segment begins thusly: Host Jimmy Carr welcomes 2018 GBBO contestant Kim-Joy Hewlett to the stage, and she comes bearing tiny meringue kisses with the panelists’ faces on them. (A quick sidenote: Fielding looks just delighted to see her, and it is lovely. Moving on.) After she passes them around, Carr asks her what happens to the food post-judging., and she replies that the crew often eat them. And that’s when Noel offers up that, from time to time, Leith takes the leftovers home to her pigs. He then adds, “That’s her pet name for me and Sandi [Toksvig, co-host],” before emphasizing that Leith does, in fact, have pigs to which she feeds the creations of Britain’s best amateur bakers. In October 2017, the National Pig Association issued a warning after Leith stated she used to treat her neighbor’s pigs to cakes and bread. The organization explained that a 2001 outbreak of foot-and-mouth had been spread after pigs on a farm in Northumberland were fed infected meat... An outbreak of Classical Swine Fever in 2000 was also believed to have begun after a pig ate a ham sandwich. Thus ends a funny anecdote about a British quiz show. Don’t feed leftovers to pigs.